The Delta Queen is America's steamboat, so authentic she has been designated a National Historic Landmark, along with Mount Vernon and the Statute of Liberty, and is listed on the National Register of Historic Places. This American treasure -- the world's only original, fully restored, steam-powered overnight paddlewheeler -- has endured the strife of World War II service and hosted a princess and three presidents on her decks. She has plied America's rivers since 1927. 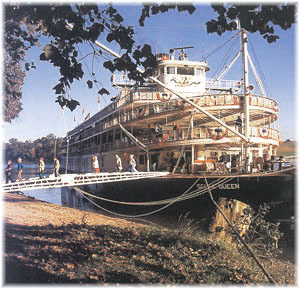 She was brought to the Mississippi River system in 1947, but the Delta Queen began her career on the Sacramento River. Built for luxury overnight travel between Sacramento and San Francisco, she was one of two steamers the Delta Queen and Delta King, became famous for their deluxe appointments -- and their astounding total cost of $1 million each! The plates for their steel hulls were fabricated in Scotland, then shipped to California for assembly. The American-built superstructures were crafted from some of the finest woods available: oak, teak, mahogany, Oregon cedar. The Delta Queen worked her Sacramento River shuttle from 1927 to 1940. The Great Depression brought an end to the runs and shortly thereafter, the Navy leased the Delta Queen. They painted her gleaming white exterior a dark gray and enlisted her to carry servicement to and from ships in San Francisco Bay, under the designation of Yard Ferry Boat 56. At the war's end, the U.S. Maritime Commission took over the Delta Queen and put her up for auction. Tom Greene, president of Cincinnati-based Greene Line Steamers -- now The Delta Queen Steamboat Co. of New Orleans -- offered a bid of $ 46,250, a fraction of the Delta Queen's original, cost, and became her new owner. Tom was then faced with the expense and obstacles of moving the shallow-draft riverboat from California to her new home on the inland rivers. With the help of the late Captain Frederick Way, Jr., and other exerts, watertight crating was constructed to protect the Delta Queen from the ocean; and arrangements were made for her perilous journey. The Delta Queen's historic 5,000-mile-voyage took her from San Francisco out into the Pacific Ocean under tow; through the Panama Canal; north into the Gulf of Mexico; and finally up the Mississippi River to New Orleans, arriving May 21, 1947. There she was uncrated before setting off under her own steam for Cincinnati, where thousands of well-wishers celebrated her arrival. The Delta Queen's next stop was Pittsburgh's Dravo Shipyard for a $750,000 "facelift". 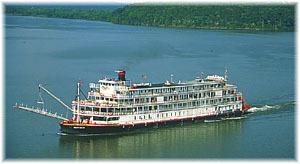 Prior to her first trip the Ohio River in June 1948, Tom Greene restored the Delta Queen's original charm and reworked the interior layout to accomodate staterooms, baths, dining and service areas. Forward decks were reconfigured to create "promenade" space, and her military gray paint was replaced by the "floating palace" steamboat white that she wears today. In the late 1960s, the Delta Queen's elaborately crafted superstructure was almost her undoing. Federal legislation outlawing wooden construction brought the Delta Queen to the edge of extinction. But by 1970, after countless letters and more than a million petitioned signatures from her fans, the celebrity steamboat was granted a congressional exemption. 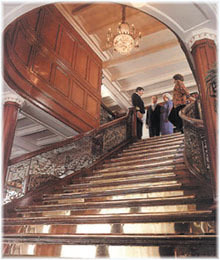 Today, the Delta Queen proundly wears her original fixtures: Tiffany-style stained glass windows, rich hardwood paneling, gleaming brass, the only ironwood flor aboard a steamboat, and the dramatic Grand Staircase, crowned by an elegant crystal chandelier. Her cabins and staterooms continue the theme of old-fashioned elegance, making a Delta Queen voyage on the river equivalent to a stay at a Victorian bed-and-breakfast. A celebrity in her own right, the Delta Queen has hosted numerous luminaries, inclunding President Herbert Hoover; President Harry Truman, who cruised with a group of Shriners in 1946; President Jimmy Carter, who mingled with river folks at ports-of-call in 1979; and Princess Margaret, who came aboard in 1986. The Delta Queen emerged on March 1998 from a three-month, $3.3 million makeover that will help ensure smooth sailing into the new millennium. The boat's rich history and fine craftsmanship were revealed before his eyes as numerous layers of paint -- first white, then Navy gray from the boat's WWII service in Sacramento Bay, then more white and finally yellow -- were stripped from major interior public areas, uncovering the original wood finish. In addition to exposing original oak bulkheads and columns in the Forward Cabin Lounge and the Betty Blake Lounge, the refurbishment team uncovered a couple of surprises. While stripping paint from the Orleans Room dining salon, they discovered some writing on the walls -- literally, "Port" and "Starboard" -- believed to be from the boat's earlies days. The walls have since been freshly painted. They also found an old Timex watch behind an original shower being replaced in one of the staterooms. Past passengers returning to the Delta Queen may notice improved ventilation or the slightly lower and larger Dining Room windows that provide a better view of America's heartland; but the most obvious result of the refurbishment is the boat's new smokestack, nine feet taller than the prior stack. 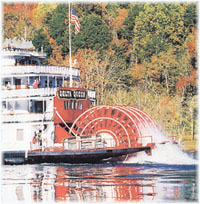 For further information: The Delta Queen Steamboat Co.